Well after having settled in, in Hastings, I am back with my Baskets From Found Materials project. As I am now busy with my business here I am not committing to a basket a week, but hope to do one at least one a month, if not more often! 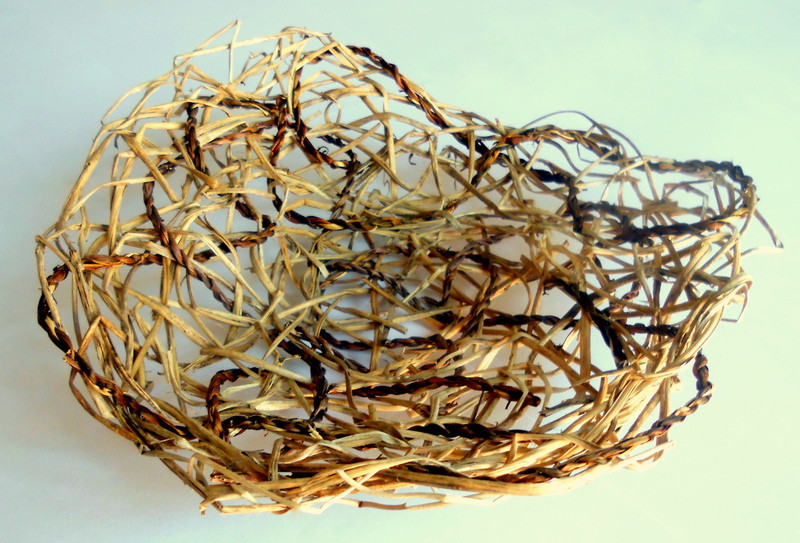 My latest 'found materials' basket is made with bindweed and another plant I found the dried remains of growing in the hedgrows. Bindweed is a plant I do not remember seeing in Scotland, where I used to live, but around here it is a curse to gardeners, its long tendrils winding their way up and around other plants. There is loads of bindweed growing in various places here in Hastings and I will be using it for my next basket as well and so will talk more about it, and show pictures of it, then. Meanwhile I'll just explain that for this irregular dish shaped basket I used cord made from the bindweed and combined it with the other mystery plant material in a random weave. It's not particularly strong so probably not very functional but was an interesting experiment and the result is quite decorative.